· Yesterday an SUV crashed into Indus Valley restaurant on the Upper West Side, shattering the glass enclosed sidewalk cafe, which was "bustling with a lunchtime crowd." No one was seriously hurt. · Late last week a fire broke out at Japanese restaurant Mura on 5th Ave in Park Slope. 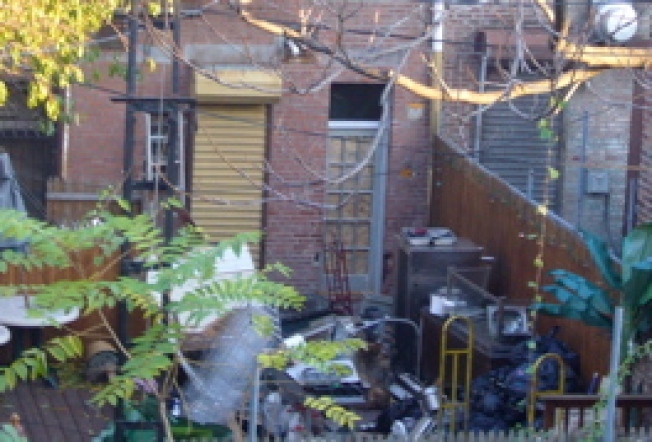 · And a correspondent sends in the photo to the right of the back patio of East Williamsburg's Latin Cuisine. Firefighters chucked all of the restaurant's appliances and equipment there after extinguishing a fire that forced the entire northwest side of Grand Street between Bushwick and Humbolt to evacuate. No word yet on whether there were any injuries.